Later this week another generation of academics will finalize their decisions about which graduate programs to attend next year—many congratulations to all of you soon-to-be grad students who will join us in the trenches at the frontier of human knowledge. Unlike undergraduate life which has a well-known idealization in Animal House (or the TV series Greek), grad school doesn’t get much publicity other than the sardonic (and delightful) PhD comics. 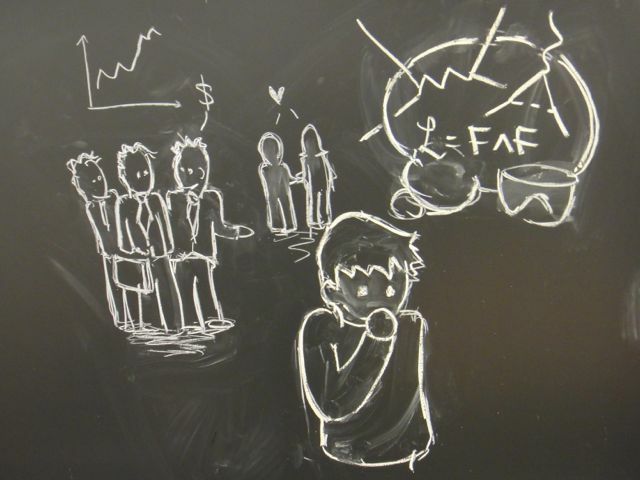 I wanted to take a moment to share some observations of what graduate school is actually like, with the usual caveat that this is just my personal perspective—each person has their own experience. (Grads and former grads: feel free to add to the discussion in the comments section.) 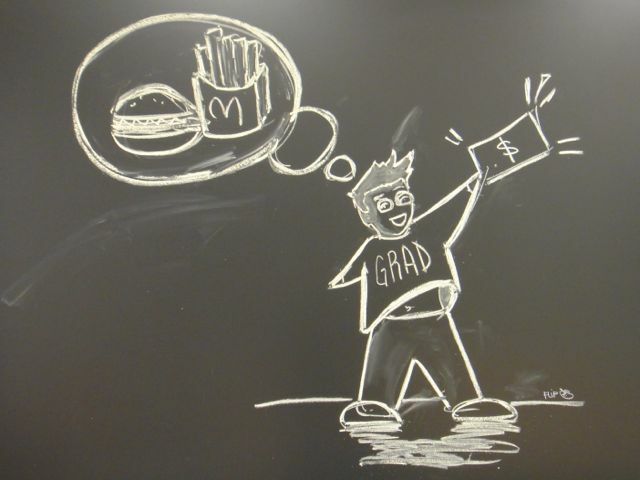 Without further ado, here are five observations about grad school. College is a lot like a Super Mario Bros. video game. You wake up, go to class, do the homework that’s assigned, and study the chapters you were told to, and rock the exam after practicing on past exams. Sure, sometimes you have to try a few times before you can make that jump right at the end of the level, but at each step it was clear what you had to do. You may have to rethink your measures of success and re-evaluate the tools you need to get there. Grad school is different. You can’t just wake up in the morning and do all the stuff that you know you have to do—because research is precisely about figuring out what to do when it is not clear at all what the next step is. In this respect grad school is more like playing a Legend of Zelda video game. Unlike coursework, research is about open questions. Usually these questions are still open for a good reason: they’re hard! You won’t have an answer key in the back of the book or a TA’s office hours to show you the trick. There’s no road map; you need to carve out your own path and figure out what tools you need to develop to move forward. Sometimes there will be dead ends and you’ll have to back-track, but in the end this can be a rewarding experience. You don’t remember Mario Bros. for how hard it was to stomp on Bowser’s head, but you do remember all the time you spent trying to figure out the puzzle to break into that one dungeon so you could rescue Zelda. One of the perks of grad school that often surprises non-academics is that yes, you get paid to do science! (Usually this is associated with doing some teaching.) In a difficult economy and with undergraduate student loans soaring, this is a welcome respite from large tuition bills and reliance on parental support. On the other hand, don’t expect to be drowning in disposable income. One trick to stretch out your stipend money: lower your standards when treating yourself to something nice. Just be careful not to fall into the trap of comparing your income to your college friends who got ‘real’ jobs. That being said, you’ll have health insurance, be able afford an apartment and food, and most importantly, you’ll have the freedom to work on what you want and how (and when) you want to. Maybe it’s just me (and I really hope not), but part of being a grad student is living precipitously on the edge of growing up. My personal experience has been full of office pranks, jokes, and the “child-ish” silliness that sometimes comes with the “child-like” curiosity that is at the heart of being a scientist. At the same time, one has to balance one’s aforementioned budget, keep pushing the less-fun parts of projects, and be responsible for the direction and content of one’s research. It’s worth mentioning that sometimes it can feel like the rest of the world is growing up way faster than you are. In addition to earning much more than you, your old high school friends will be getting married and starting families—the latter of which is something which can be difficult (though not impossible) as a young academic. High school reunion can be a reminder that everyone else has "grown up" while you're still in school. In a larger sense, grad students are fledgling scientists, apprentices to professors who train their academic offspring. And just like biological offspring, it’s often the case that the apple doesn’t fall far from the tree—after all, your grad school mentors are the ones who teach you how to think about your science, how to grapple with hard problems, and (very important) how to interact with other scientists. Whatever discipline you’re in, and no matter how smooth things seem to be going for the other students, graduate school is hard. (So are professional schools and real grown up life, for that matter.) Sure, most people are prepared to spend their PhD working on hard research questions. What people don’t usually expect is that often it’s actually everything else that makes a PhD hard: balancing your work with the rest of your life. “Rest of your life?” It’s a cliche that grad students don’t have lives outside of their labs, and it’s completely wrong. The most successful students—both in undergrad and grad school—are often the ones who have something else that they’re passionate about and that is totally unrelated to their work. Maybe music or art, maybe a particular sport, or a social activity (blogging? )… something to dive into and keep you sane when work isn’t going well—and there will be times when work is not going well. In many ways the defining moments in graduate school aren’t when research is going well, but rather those times when it feels like everything is crumbling beneath you. Those moments when you feel like you should chain yourself to your desk until everything works? Those are usually the times when the best thing you can do is to take a step back for a bit and relax. It’s crucially important to recognize that things will not go as smoothly as you plan. 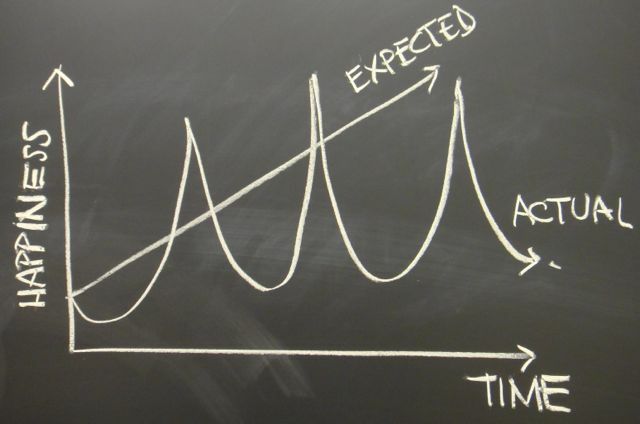 Consider the following very-scientific graph of happiness over time. Actually, the pointy curves come from something I've been working on (with different labels). Naively, one might imagine that grad school is a period where you just keep learning more and more about something you enjoy until you steadily become the world expert on something really important. What actually happens is that you spend most of your time grappling with the frustrating problems that prevented other people from doing this research before you. Then, with some luck, there are brief moments of ecstatic clarity where you make progress: you’ll remember why you’re doing a PhD and all will be right in the world… for maybe a day or two, at which point you’ll come up to the next hurdle that you’ll have to struggle with. Footnote: Not every PhD becomes an academic! While there is something special about spending your life pursuing fundamental science, but that doesn’t mean it’s the right path for everyone. And this is not to say that some people “aren’t cut out” for research or that their PhD was not well spent: I’ve seen some truly special and talented individuals with bright academic futures decide that they would be happier applying the skills they developed on something else. And that’s great—one of the reasons why our country invests in fundamental research is to support a highly skilled workforce doing exciting things outside of the ivory tower. I’ve had difficult conversations with multiple young academics who have struggled to weigh their passion for science against pragmatism: what if they can’t find a job sufficiently close to their spouse? What if they want to settle down and start a family rather than having to bounce between temporary grad and postdoc positions? What if they need to take care of ailing parents and cannot hold off until the indeterminate future to secure that kind of financial stability? Fortunately, a PhD is something which generally translates into marketable skills “in the real world,” and I think it’s important for those in academia to recognize that sometimes good people will leave the field for good reasons. I’d like to wrap up by once again addressing the next generation of grad students with some unsolicited advice from someone crawling towards the light at the end of his own PhD tunnel. 1. Find good mentors. Your adviser will have a big impact on your PhD and career, but you should also make a point to find mentors in the form of other faculty, postdocs, and graduate students. Learn as much as you can from the people around you, especially when they can offer advice that they had to learn the hard way. 2. Persistence and enthusiasm goes a long way. You can expect to run into setbacks and roadblocks. One of the most useful things you can develop is an enthusiasm for your work and the persistence to keep pushing even when things feel futile. Persistence and enthusiasm can make up for a lot of things: lost sleep, raw intelligence (when you feel like everyone else is smarter than you), gaps in your problem-solving toolbox, etc. 3. Learn how to communicate. One of the cornerstones of science is being able to effectively communicate your work to others. Learn how to effectively read and write papers, and learn how to give good talks about your research. 4. Use your freedom wisely. For the most part, people won’t tell you how to spend your time. It’ll be up to you to work on what you want, when you want to, and however you think will best solve the problem. Just be careful that you’re not using all of this extra rope to hang yourself. Find the right balance of work and play that works for you. 5. Science is social. There is synergy in academia. People wonder what theorists do all day long since it seems like all we do is to think up silly ideas—we spend most of the day talking to each other. Ideas are meant to be bounced off of one another: revised, refined, and re-assessed. Don’t fall into the bad habit of hiding in a hole in the ground until you find the answer—make use of the community around you! Science is a team sport, it helps to figure this out earlier rather than later. While we’re on this note—take time to be part of the science community in your field. There are some scientists who develop their best ideas while hiking with friends or at a pub after a conference. 6. Let it be fun. Despite all the things one has to struggle with from research to personal life and everything in-between, grad school is a special time in your life; enjoy it.